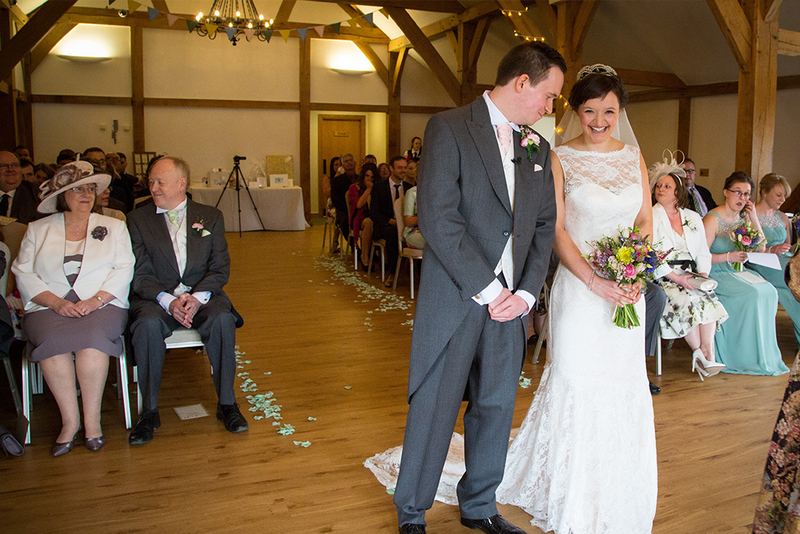 When Emma and Andrew met through a friend at a house-warming party, a relationship bloomed and after only a short time together, they made the brave move to the Isle of Man. A rare and exciting adventure together; it was each other and the beauty of the island’s beaches, waterfalls and glens that they fell in love with… and experiencing the world-famous TT races! On Christmas Day the year after becoming a couple, Andy proposed by a stream during a walk through Ballaglass Glen. “He even got down on one knee in the mud! There was nobody else around so it was really private and special,” says Emma. The couple wanted to get married in March, the month they met, and their story would inspire the décor and theme. 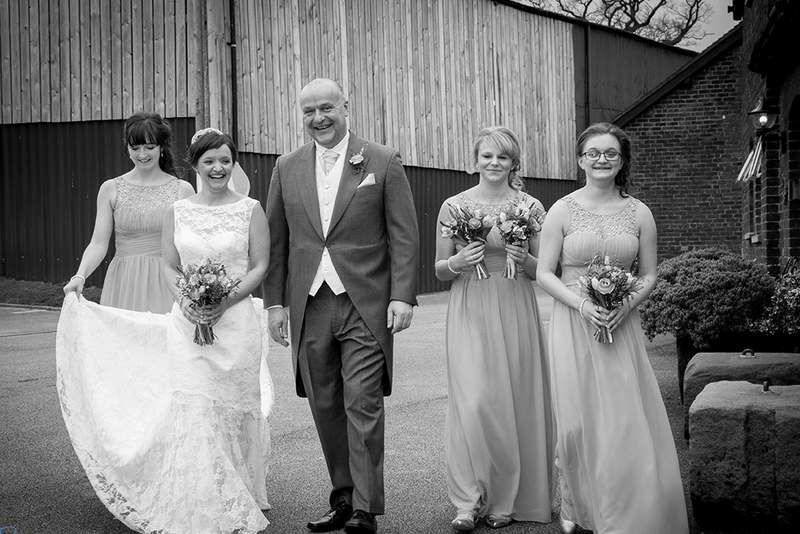 Emma and Andrew knew that they wanted an informal day for everyone to catch up and celebrate together. 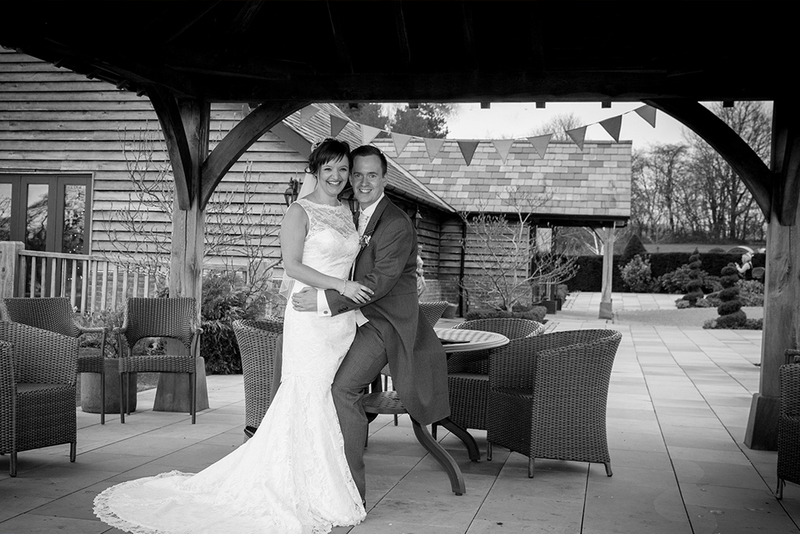 “We wanted our wedding to be laid-back and fun – where people could relax and really enjoy themselves,” says Emma. 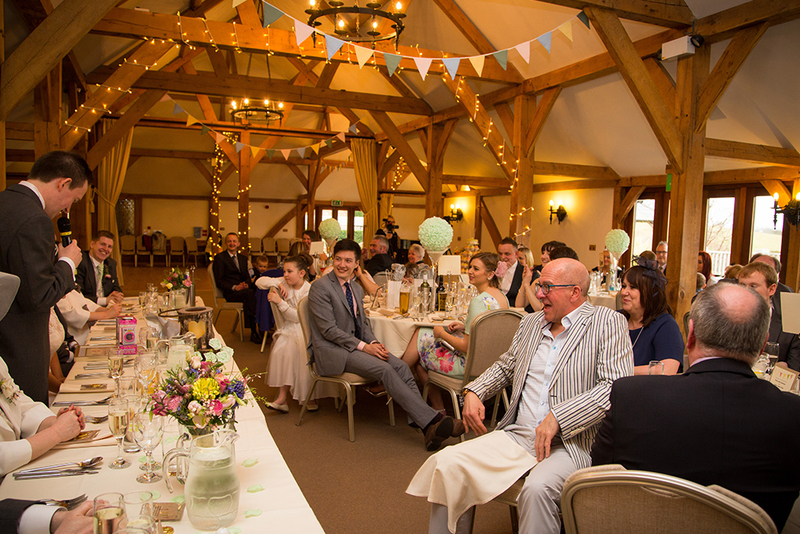 With hectic lifestyles and widespread family and catch up time with friends proving rare – how the day would be enjoyed by their guests was key in their search for the perfect venue. 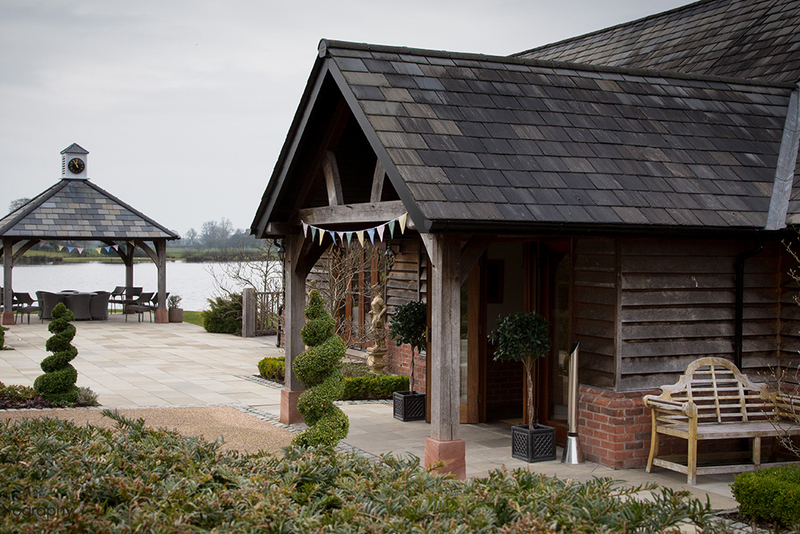 “Our first impression upon visiting Sandhole Oak Barn was a personal, private space for us to really make our own. 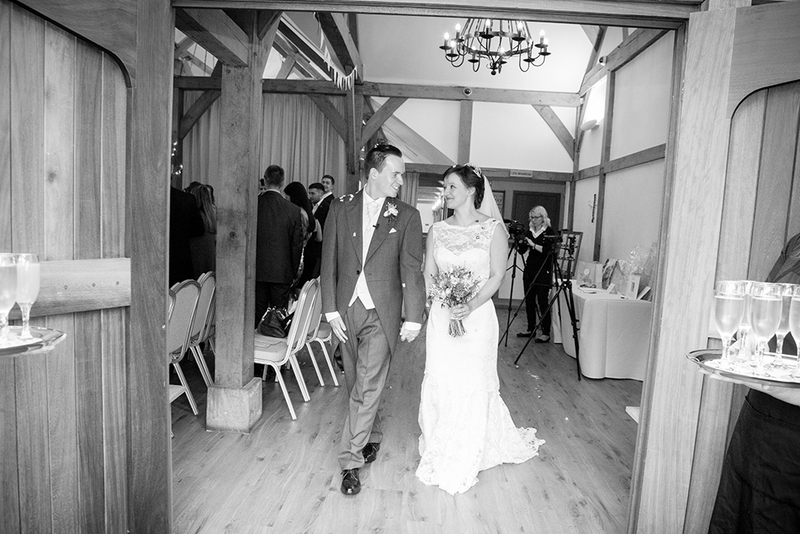 The barn itself was really fresh, modern and bright – exactly what we wanted for our big day!” Emma explains. 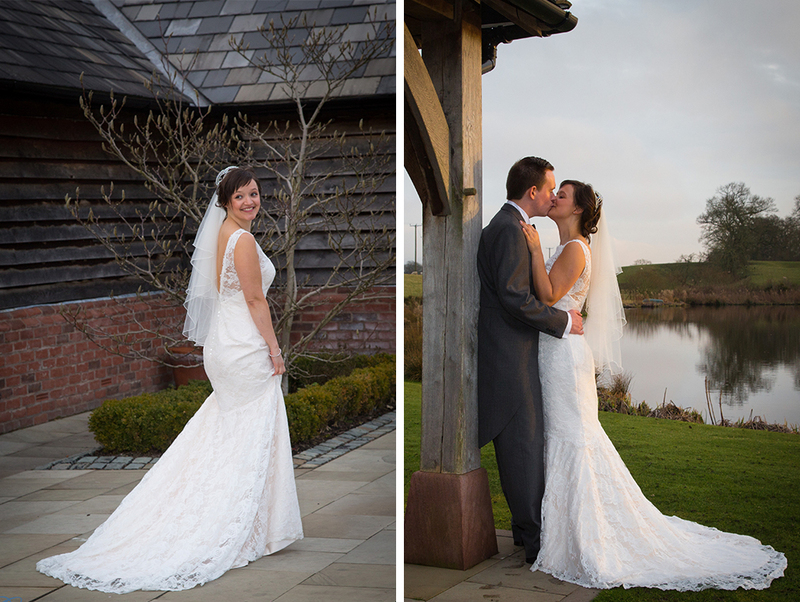 Emma’s dress was a simple yet stunning lace gown by Charlotte Balbier – the first dress she tried on. “We wanted our day to be bright and fun. We didn’t have a colour scheme as such, it was all about creating a bright day of celebration and creativity,” explains the bride. 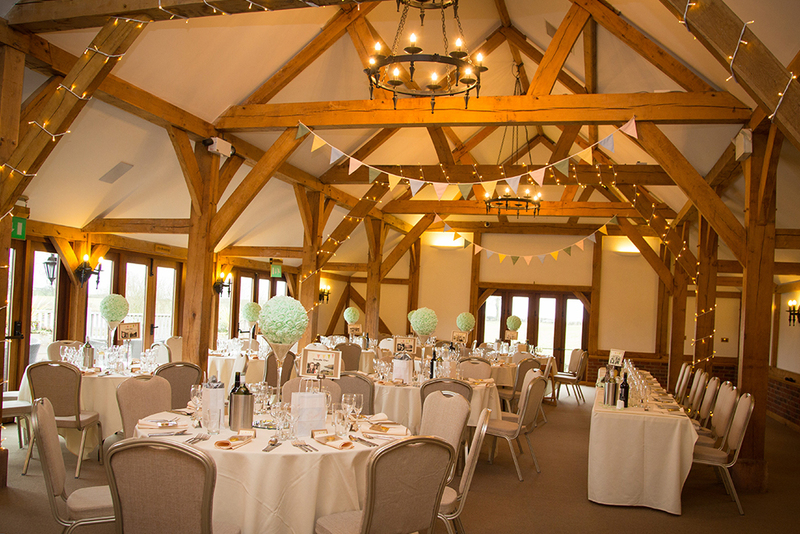 Emma hand-made bunting to hang all throughout the venue in a variety of pastel colours. 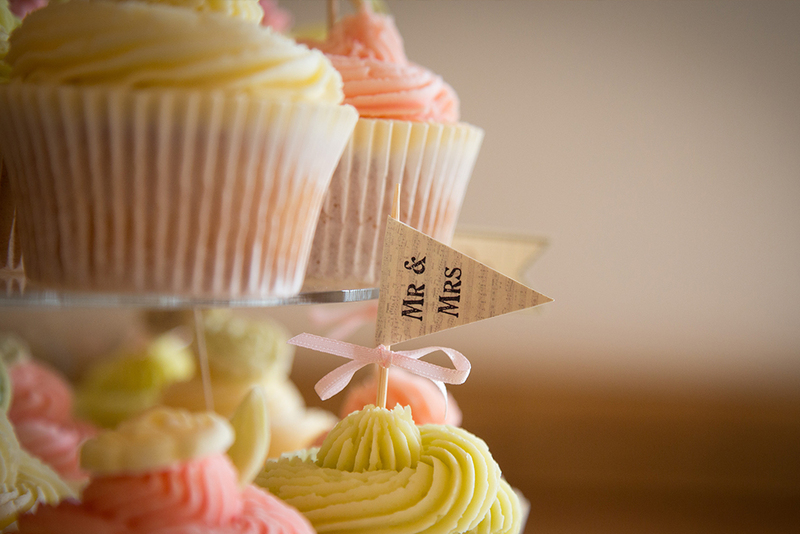 These colours were then emulated in the cupcake tower that they had as their wedding cake. The couple made hemp wish bracelets as favours in pastel colours with delicious Isle of Man chocolate coins. The tables were all named after favourite places and personalised with pictures of the couple’s time on the Isle of Man. Canapés after the ceremony included spicy butternut squash soup shots and deliciously filled mini jacket potatoes. A light starter of caramelized onion tart, was followed by chicken with parmesan mash and Mediterranean vegetables. Their dessert trio proved incredibly popular: a trio of Prosecco jelly, lemon tart and chocolate mousse. 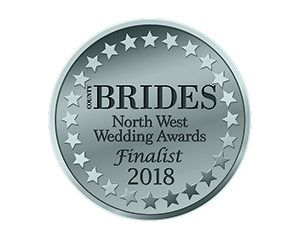 With the hosting and planning left to the approved caterers Top Table, the couple could relax and just everything enjoy their wedding day to the fullest. 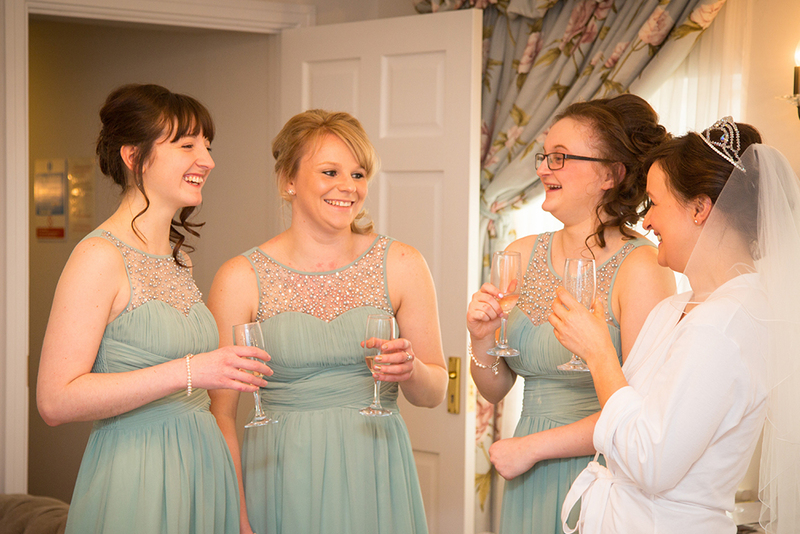 With no expectation to spend her reception meeting and greeting, guests caught up with the bride on the dance floor! Emma recalls dancing the night away. 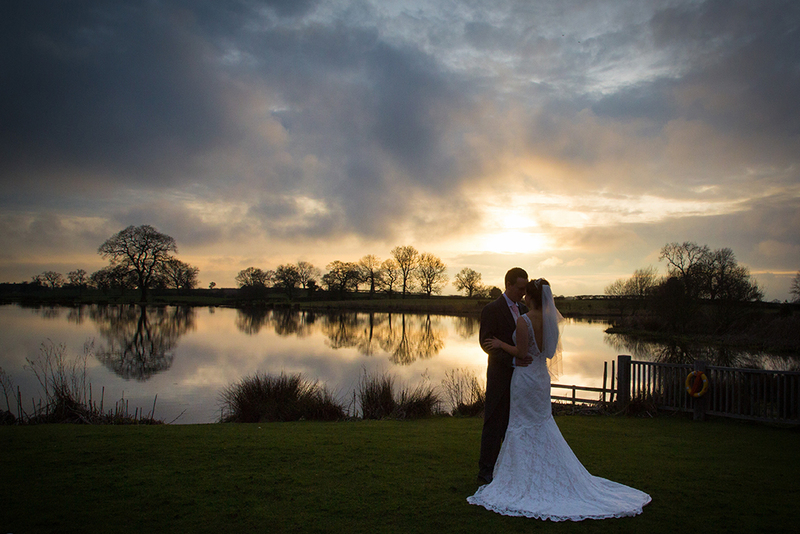 After their evening reception, Emma and Andrew were able to recount their memories of the day together. 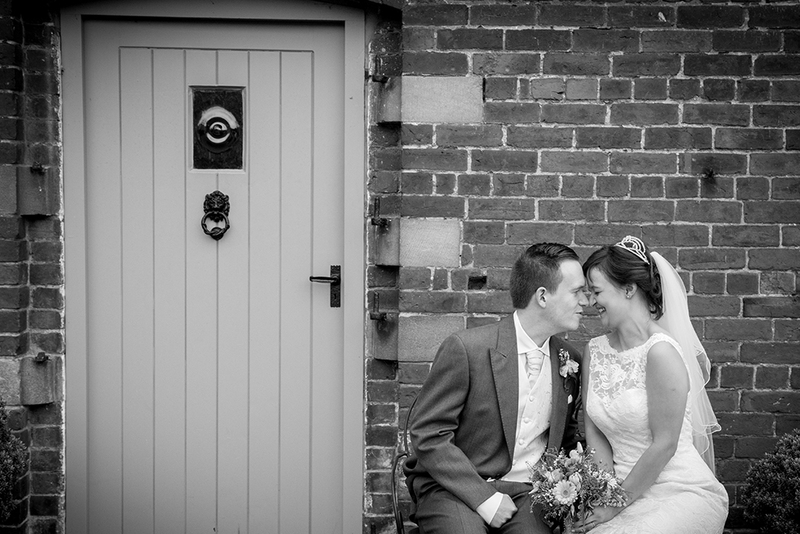 They retired to the lovely Granary Cottage in the nearby four-star Sandhole Farm B&B. Thinking about your Sandhole Wedding? 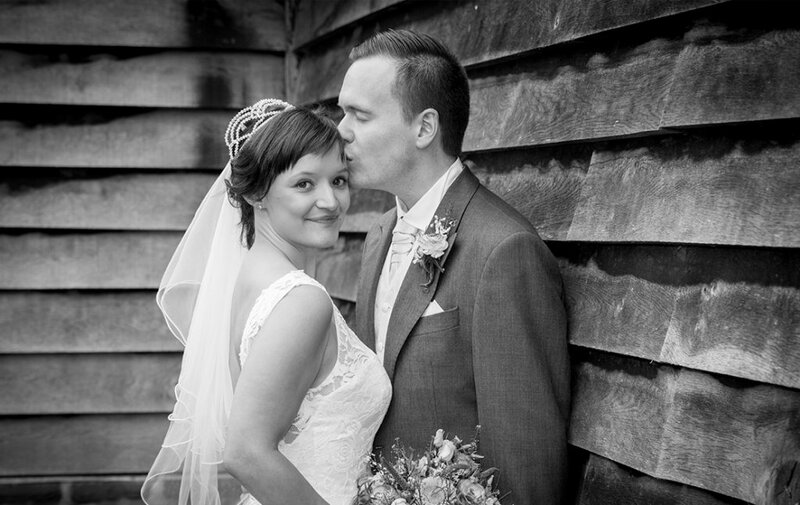 Sandhole Oak Barn is the perfect venue all year round, so take a look at Lorna and Paul’s Wedding for some autumnal inspiration.